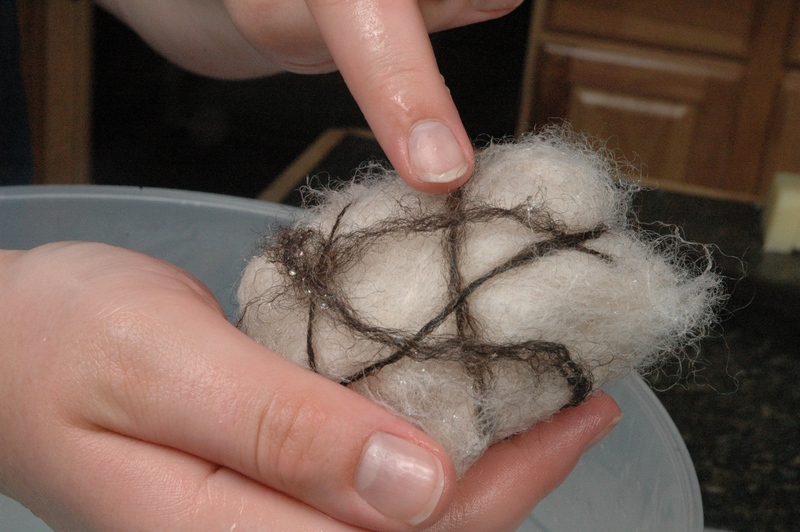 I have a family friend who showed me how to make wool wrapped soap. Lynn from Spinderellas, www.spinderellas.com, has known my mother for several years as they are both spinners. Lynn has been caring for our fleeces, by washing and carding them. She taught us how to make wool wrapped soap too, and I have to say I love them. Wool wrapping is a fun way to present your soap, and does not require the use of a washcloth to create a rich, thick lather. 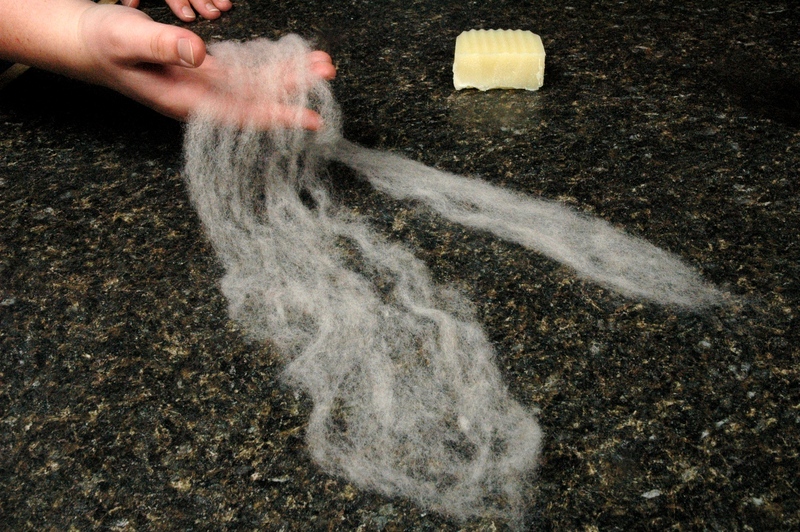 You do not need to worry about the wool becoming too large for your soap because it will continue to felt, shrinking with your soap. Now before I get too far into how to make a wrapped soap, I will explain some of the terms. 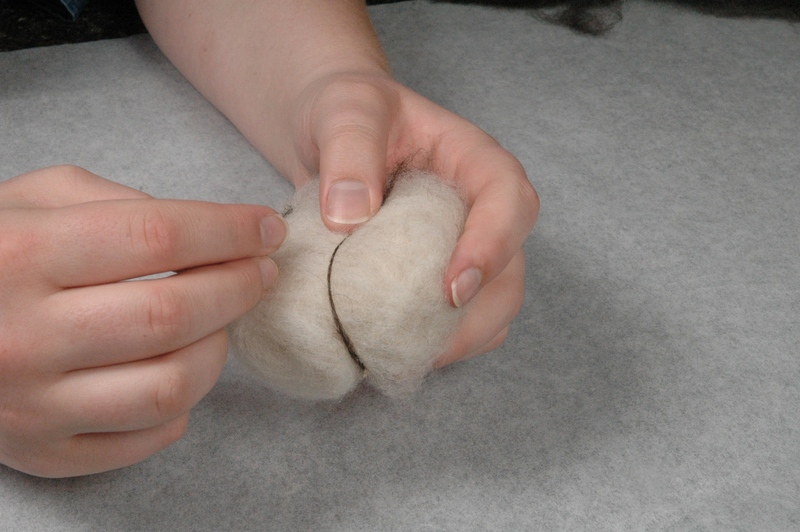 Roving is fiber that has been carded, and top is combed. 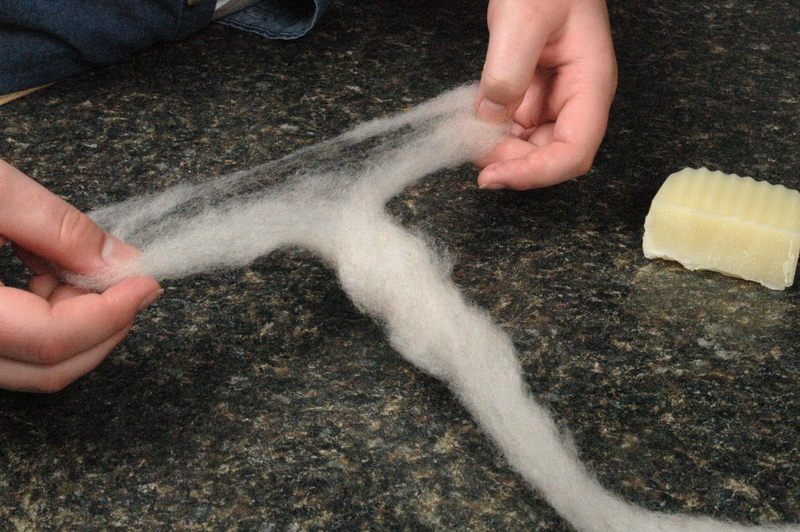 Top and roving felt differently because of the arrangement of the fibers. Sliver is roving or top that is split length wise. 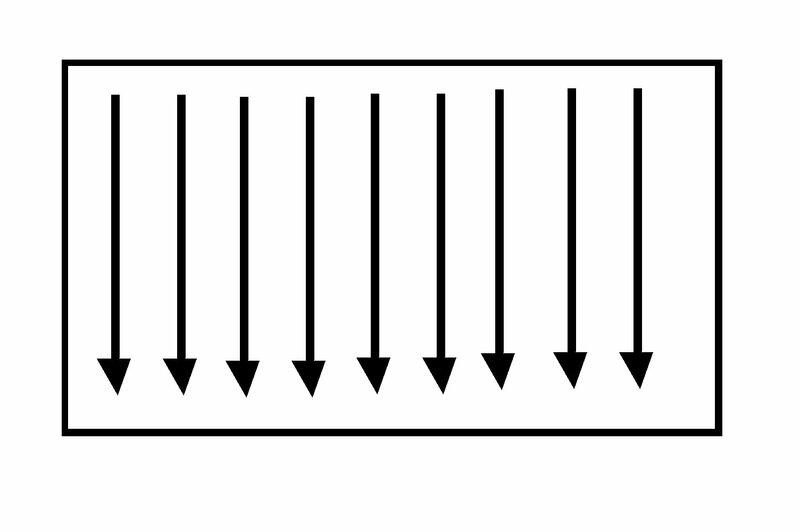 In top, the fibers are parallel making it harder for them to grip each other and felt. 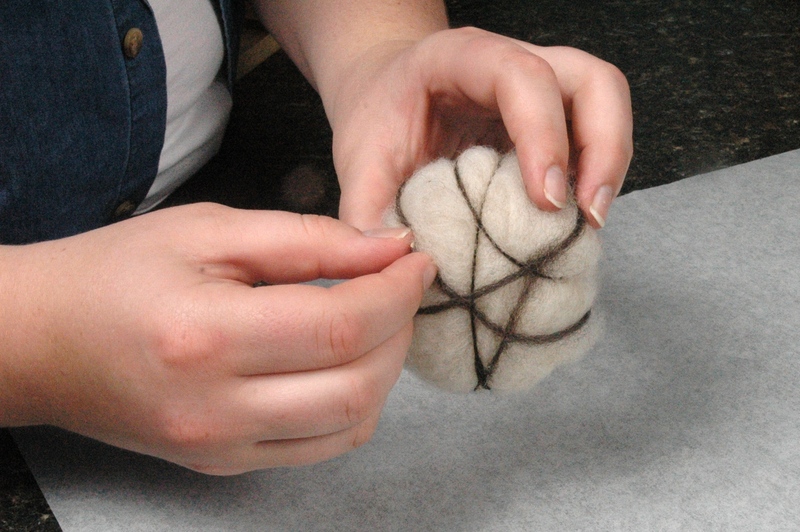 In roving, the fibers are every which way allowing them to grip each other and felt more readily. 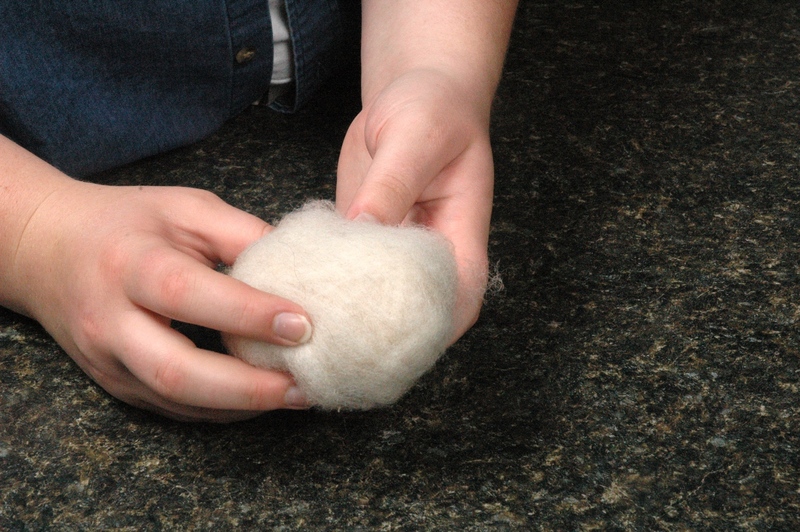 When you are getting your wool you will want to get roving, not top. 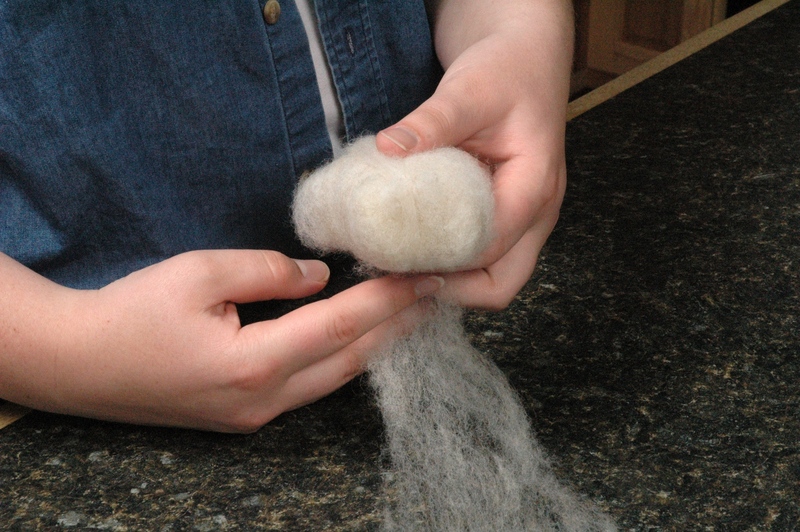 You will also want to make sure you get plain wool roving and not a wool blend. This will insure that as your bar shrinks, the wool shrinks with it. If you don’t have wool around the house, but want to try this project, order some thrums from Spinderellas. http://www.spinderellas.com/thrums.html will show you a nice offering of colors in 4 ounce to 1 lb increments. The Spinderellas thrums make beautiful soaps. Take a long length of your roving, about 18 inches. Split it length wise. 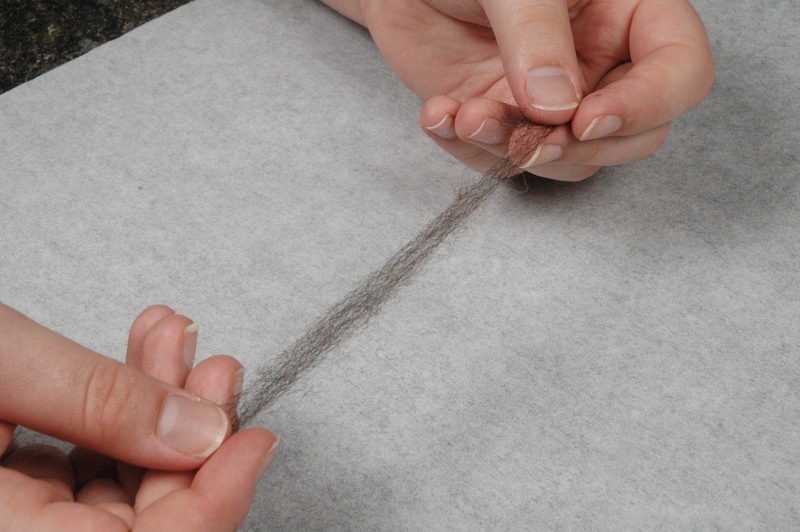 Fan out the fibers to make a wide strip, about 1.5 inches wide. 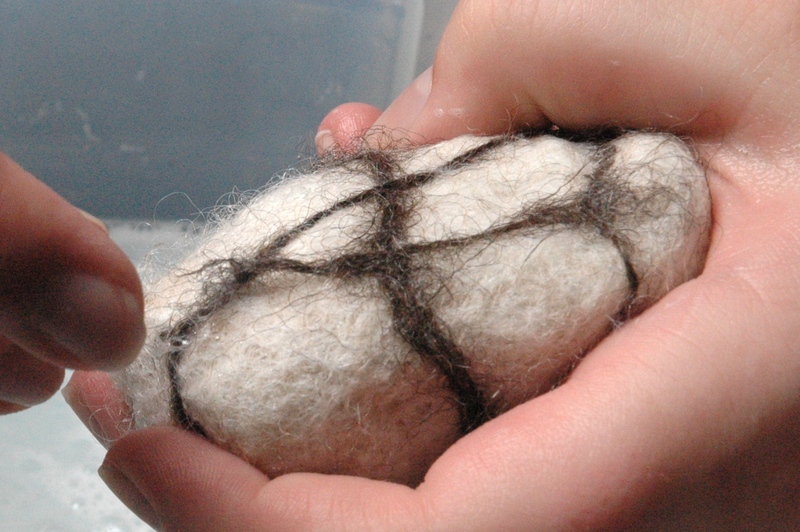 The wool should have a somewhat lacey appearance, it should not be thick and dense. It is better to have more layers of fanned wool, than it is to have a big chunk of roving as the wrapping. Holding your soap in one hand, wrap your bar of soap starting from one corner and continue to the other corner. Do not twist the wool when you wrap around the bar soap, fold the fan at each 90 degree angle, and continue. 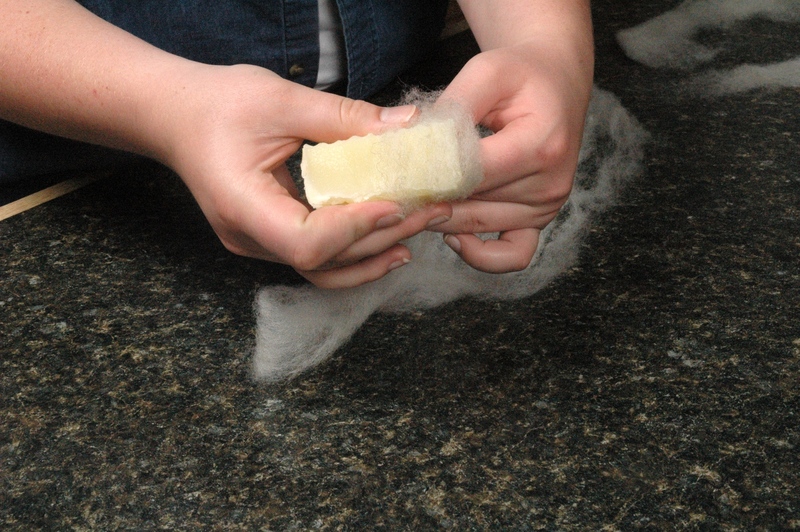 This action will appear as more of rolling the soap around the wool, that twisting the wool around the soap. It is very important that the wool strip lays flat against the soap. 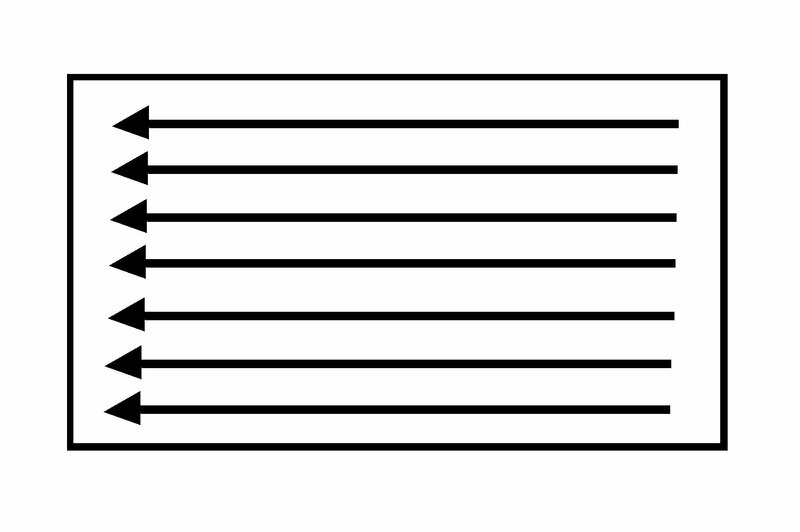 When you get to the opposite corner, turn your bar of soap a quarter turn counter clockwise (clockwise if you are wrapping left handed) and wrap the soap again. Make sure that the corners are well covered. Repeat until you have a thick layer of wool wrapped evenly around the bar. Wrap all of your soaps so you are ready to wash/felt them in a single session. Now that all of your soaps are wrapped we can felt them. Fill a large sink with hot water. 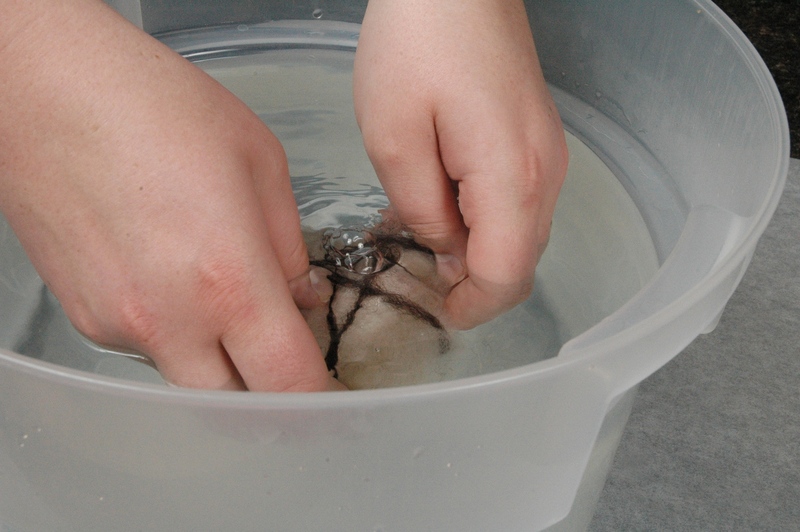 Take one of your wrapped soaps and submerge it. Bring it out of the water and squeeze your soap gently. Don’t rub so that your roving comes off. 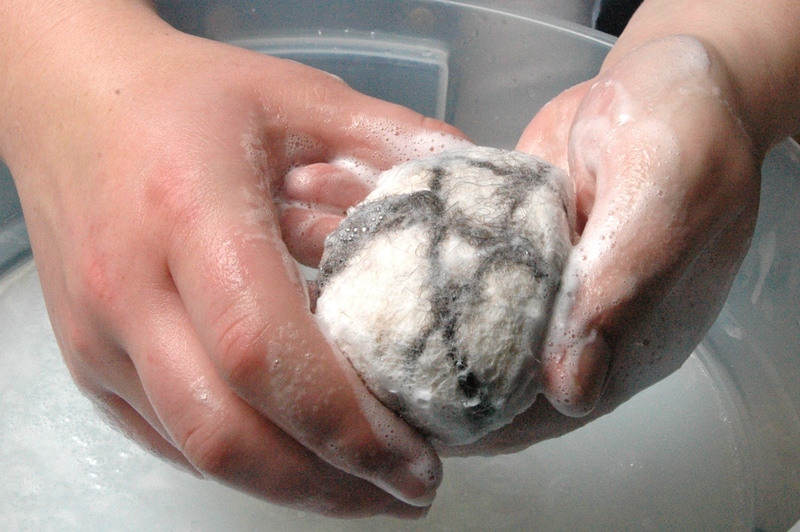 Squeeze the soap repeatedly, turning and re-dunking the soap until the roving feels dense and no longer like a soft fuzzball. The roving has now felted enough so it will not move freely. 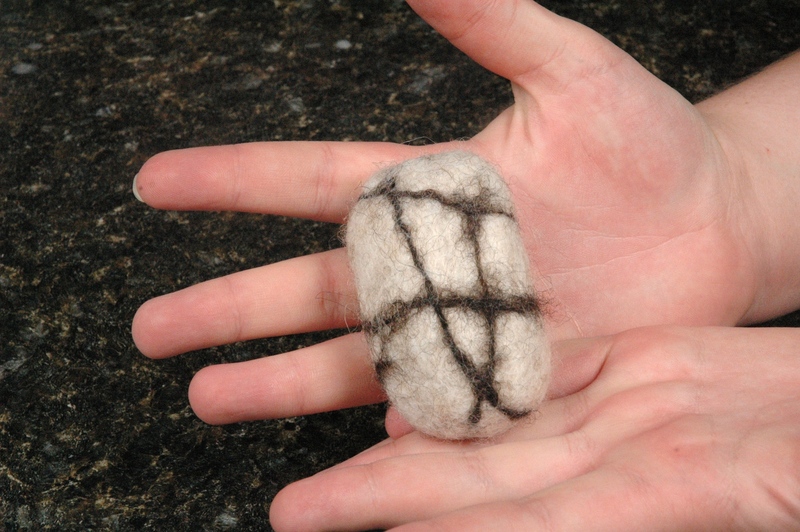 Now you can rub vigourously so the wool creates a firm blanket around your soap. 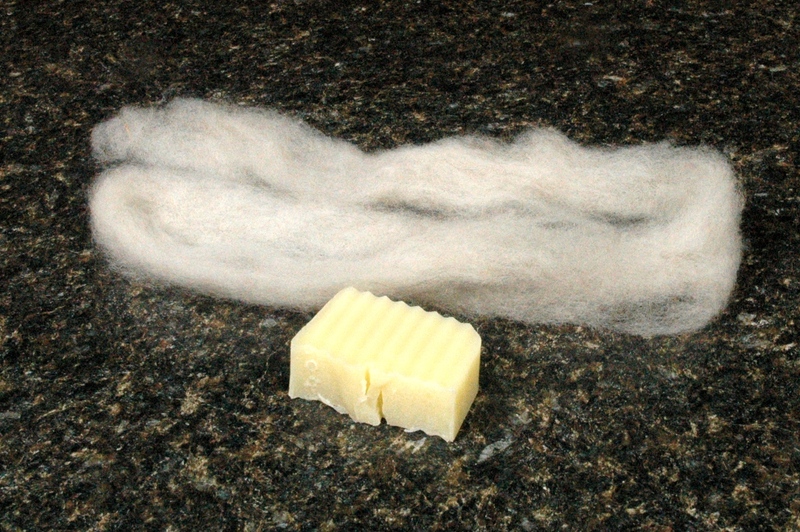 Once the wool is completely felted, place the felted soap on a cookie rack so it is able to dry completely. Repeat the washing sequence with the rest of your soaps. Splitting the wool to create sliver. The wool is completely fanned out. See the lacey appearance? 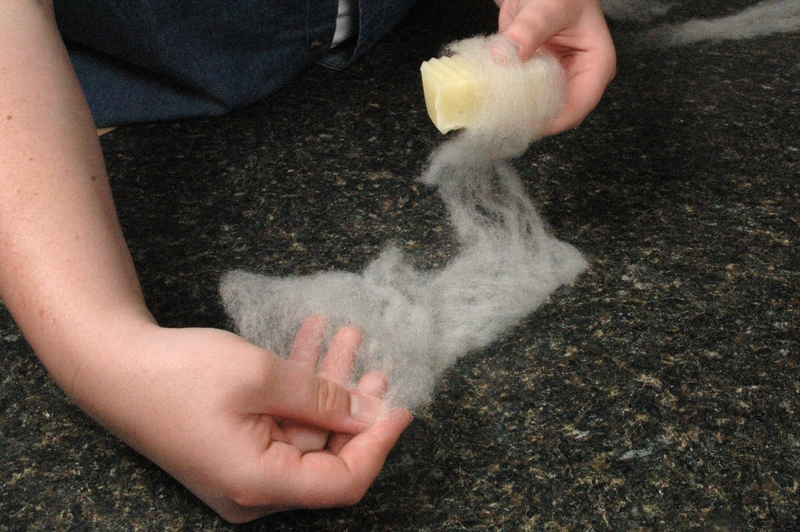 Starting to wrap the fanned wool around the soap. Wrapping the corners of the soap. Thin sliver ready to wrap around the soap. Finishing wrapping the soap with the colored sliver. 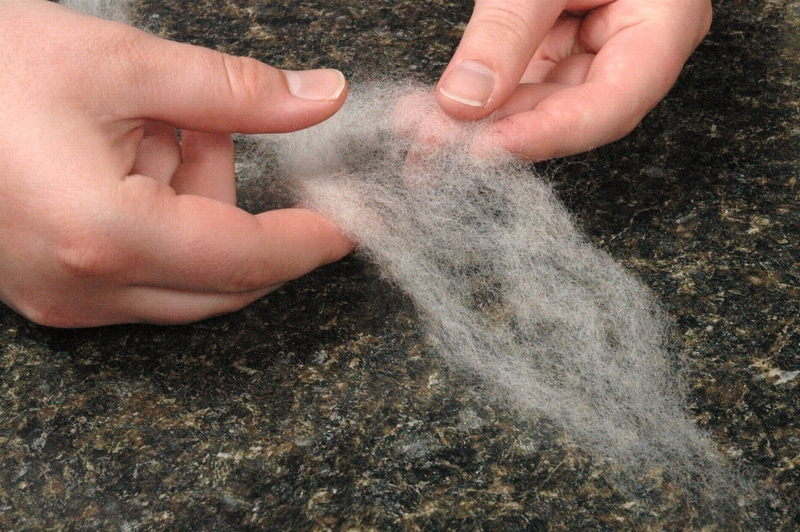 This wool has not felted much. Wrap the wool around the soap in this direction first, slightly overlapping the previous layer with each new wrap. Continuing to wrap the soap. The soap is completely wrapped. Wrapping the colored sliver around the soap. 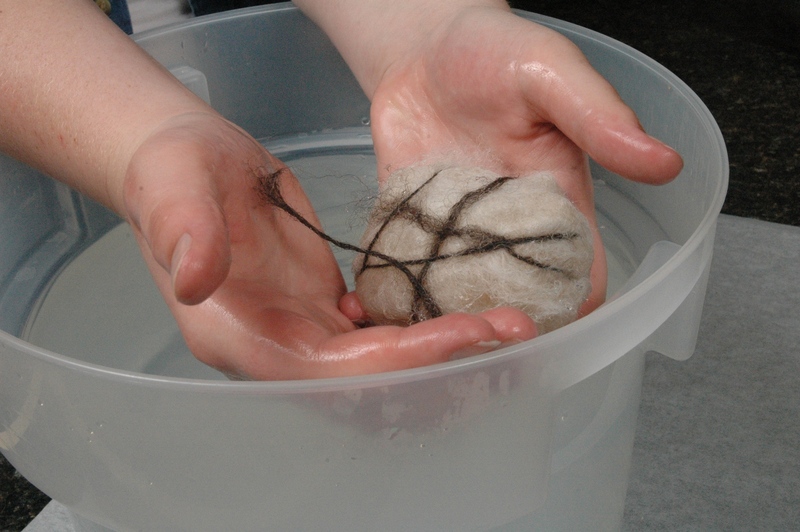 Imersing the wool wrapped soap in hot water. Can you see the colored sliver sticking to my hand? This soap is just about ready to be rubbed. Wrap the wool around the soap in this direction second. Watch the corners! I LOVE this idea! I don’t make soap, and I usually use liquid bath stuff, but this idea totally makes me want to make soap. I do make candles, so soap is going to be an eventuality that I’ll try sooner or later. A couple other things. I didn’t want my comment to get lost in the older post. The star soaps and the embed soap that you asked if it was a mistake or not . . . I thought they were both beautiful. I’ve had issues like that with my candles too where I feel like it was messed up, but my hubby doesn’t think so. He’s so nice. But he’s a salesman and he always tells me that I already made it, so go ahead and put it out for sale and let the customer decide if it’s a mess up or art. I would just say don’t automatically call them mistakes and throw them in the discount bin. Instead fix up a shelf for one of a kind artistic soaps. But whatever happened to those star soaps, I think you should make them like that on purpose. Wow oh wee I’ve just found this and just in time. I have some “mistake” soaps that didn’t color the way I wanted so I decided I would learn to felt them and give them to the homeless shelters or battered women’s homes. That way no wash cloth would be needed in order to bath. This post was exactly the ticket it shows me step by step what to do unlike other felting tutorials. Thank you today is the 1st day of 2013 and I’m going to felt for gifts to those homes today. THANK YOU I LOVE YOU ALL YOUR PURE GENIUS! I’m glad to hear this! I hope these soaps are enjoyed!